A nebula is a cloud of dust and gas where stars are made. Ionized gasses such as helium and hydrogen combine with interstellar dust and start to gain mass. Over milions of years, the mass gets more dense and starts to generate heat. Once thermonuclear fusion starts a star starts to form. 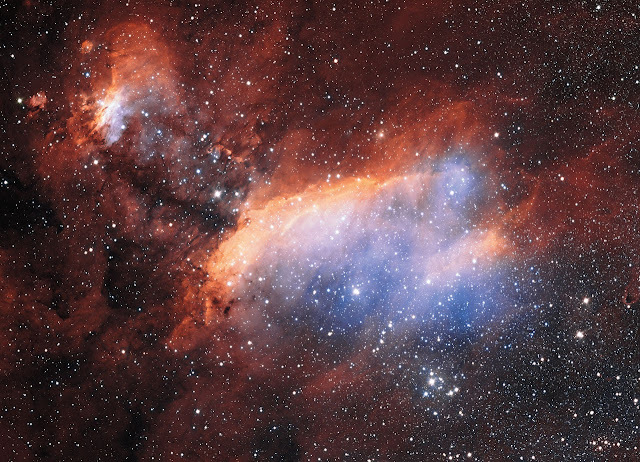 The image of the Prawn Nebula was taken by the largest telescope in the world, the VLT Survey Telescope (VST). It is a 2.6-metre telescope built around the OmegaCAM camera that contains 32 CCD detectors that can create 268-megapixel images. This new 24 000-pixel-broad image is a mosaic of two such images and is one of the largest single images released by ESO so far. This is the 1000th press release by the ESO. A milestone that started in 1985 when it featured an image of Halley's comet by the ESO 1 metre Schmidt telescope at La Silla on December 9, 1985 . Located around 6000 light-years from Earth in the constellation of Scorpius (The Scorpion), the nebula formally known as IC 4628 is a huge region filled with gas and clumps of dark dust. These gas clouds are star-forming regions, producing brilliant hot young stars. In visible light, these stars appear as a blue-white colour, but they also emit intense radiation in other parts of the spectrum — most notably in the ultraviolet (the same kind of radiation that causes skin to burn). It is this ultraviolet light from the stars that causes the gas clouds to glow. This radiation strips electrons from hydrogen atoms, which then later recombine and release energy in the form of light. Each chemical element emits light at characteristic colours when this process occurs, and for hydrogen the predominant colour is red. IC 4628 is an example of an HII region (ionised hydrogen). The Prawn Nebula is around 250 light-years across, covering an area of sky equivalent to four times that of the full Moon. Despite this huge size it has been often overlooked by observers due to its faintness and because most of its light is emitted at wavelengths where the human eye is not sensitive. The nebula is also known as Gum 56, after the Australian astronomer Colin Gum, who published a catalogue of HII regions in 1955. This image was taken by the VLT Survey Telescope (VST) at ESO’s Paranal Observatory in Chile. The VST is the largest telescope in the world designed for surveying the sky in visible light. It is a state-of-the-art 2.6-metre telescope built around the OmegaCAM camera that contains 32 CCD detectors that together create 268-megapixel images. This new 24 000-pixel-broad image is a mosaic of two such images and is one of the largest single images released by ESO so far. The picture forms part of a detailed public survey of a large part of the Milky Way called VPHAS+ (The VST/OmegaCam Photometric Hα Survey) that is using the power of the VST to search for new objects such as young stars and planetary nebulae. The survey will also provide the best images yet taken of many huge glowing star formation regions, such as the one pictured here. The very sharp VST images were further enhanced to bring out the colour by including additional high quality imaging through other filters taken by Martin Pugh, a very skilled amateur astronomer observing from Australia using 32-centimetre and 13-centimetre telescopes. This press release represents a milestone — it is the 1000th press release issued by ESO. The first one appeared in late 1985 and featured a picture of Halley's Comet. They are all available online.